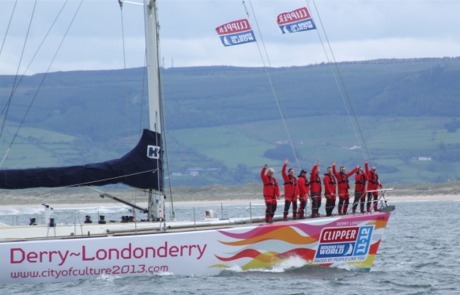 THE public got its first glimpse of the Derry-Londonderry Clipper yacht, skipper and crew when it sailed through Greencastle yesterday on its way to the Foyle Days maritime festival. The yacht's visit to this weekend's festival, comes ahead of the start of the Clipper 2011-2012 Round the World Yacht Race. At 40,000-miles, the Clipper is the world’s longest yacht race and will get underway from the south coast of England on July 31. Derry will host a stopover for all ten of the 68-foot yachts in July 2012. The crews are drawn from all walks of life and represent more than 40 nationalities. Almost half of them have never sailed before, embarking on their pre-race training to prepare them for the gruelling challenge ahead. People in Inishowen got the first glimpse of the Derry-Londonderry Round the World Clipper yacht when it sailed up Lough Foyle yesterday on its way to the Foyle Days maritime festival in Derry. Derry Mayor, Cllr Colum Eastwood said he was delighted to welcome the crew and skipper of the yacht that would represent the city in the iconic race. The Derry~Londonderry Clipper yacht will be berthed at the Foyle Pontoon during Friday and Saturday and will depart on Sunday following a blessing ceremony by local church leaders at 12.30pm. For more photos, click here .